Ice crystals play an important role for the radiative properties of clouds as well as for the formation of precipitation. Mixed-phase clouds are clouds that consist of both, super-cooled liquid droplets and ice particles. They account for a large fraction of the clouds in the atmosphere but our knowledge on the microphysical properties of these clouds is still limited. An important question is how ice forms in these clouds. While it is well established that an ice nucleus is needed as a seed for the initial formation of an ice crystal in mixed-phase clouds many questions remain to be answered on the concentration and variability of atmospheric ice nuclei and their physico-chemical properties. The Research Unit “INUIT” (Ice Nuclei research UnIT) studies heterogeneous ice formation in the atmosphere. The studies include laboratory investigations on the nature of the nucleation process and on the chemical, microphysical and biological characterization of atmospherically relevant ice nuclei as a function of temperature and water saturation. Intensive field experiments are conducted as well as monitoring surveys to study the number concentration, variability, size, chemical composition, surface properties and sources of atmospheric ice nuclei in different freezing modes. Various state-of-the-art methods and facilities are used for the characterization of the ice nuclei. Ice nucleating properties of mineral dust particles, volcanic ash, and biological ice nuclei are a focus of attention of the INUIT research unit. The results of the experimental investigations are fed into a cloud process model and a cloud-resolving meso-scale model to improve the representation of clouds in the models, to simulate cloud processes and to quantify the contribution of ice nuclei types and freezing modes. The INUIT research unit comprises 9 research projects from 8 partner institutes (Goethe-University of Frankfurt/Main, University of Bielefeld, University of Mainz, Technical University Darmstadt, Leibniz-Institute for Tropospheric Research, Max-Planck Institute for Chemistry and Karlsruhe Institute for Technology). It is funded by the Deutsche Forschungsgemeinschaft DFG (grant no. FOR 1525). The new Twin-plate Ice Nucleation Assay with infrared detection for high-throughput droplet freezing experiments in microliter-sized droplets is introduced, which was tested and characterized with bacterial and fungal ice nuclei. It was applied to investigate the influence of chemical processing on the activity of biological ice nuclei, and aqueous extracts of atmospheric aerosols were studied for ice nuclei activity. It is important to study ice-nucleating particles in the environment to learn more about cloud formation. We studied the composition of ice particle residuals and total aerosol particles sampled in parallel during mixed-phase cloud events at Jungfraujoch and discovered that soot and complex secondary particles were not present. In contrast, silica, aluminosilicates, and other aluminosilicates were the most important ice particle residual groups at site temperatures between −11 and −18 °C. 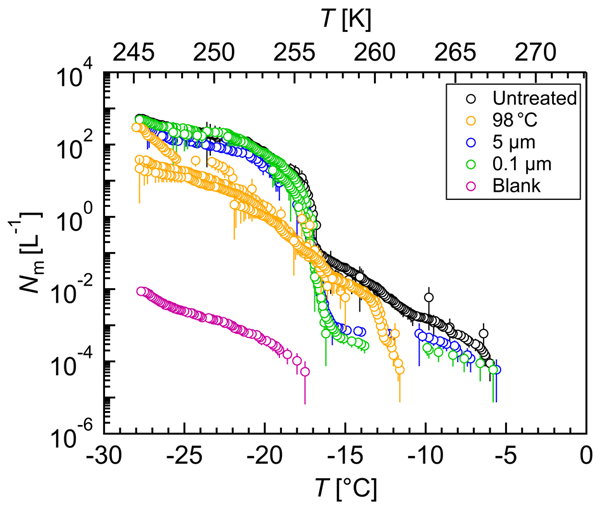 In this study, coal fly ash particles immersed in supercooled cloud droplets were analyzed concerning their freezing behavior. Additionally, physico-chemical particle properties (morphology, chemical composition, crystallography) were investigated. In combining both aspects, components that potentially contribute to the observed freezing behavior of the ash could be identified. Interactions at the particle-water interface, that depend on suspension time and influence freezing, are discussed. In deep convective clouds reaching altitudes of 14 km, heavy rain is often formed involving the ice phase. Ice nucleating particles (INPs) are responsible for heterogeneous freezing at middle and lower altitudes. Cloud model simulations indicate that INPs may effect a gradual increase in precipitation at early cloud stages instead of a strong increase at later cloud stages. Simultaneously, the local distribution of precipitation is changed, with more precipitation in the cloud center. The ice nucleation activity of urban aerosols in the atmosphere of Beijing was detected in this study. 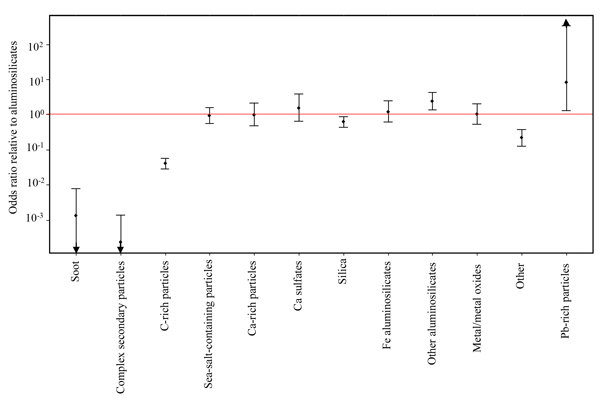 Results showed that ice-nucleating particle (INP) concentrations were not influenced by the highly variable numbers of atmospheric particles, both in mass and particle number concentrations, implying that INP concentrations might not be influenced directly by anthropogenic activities, at least not down to roughly −25 °C and maybe even below. Several instruments can investigate properties of ice-nucleating particles (INPs), which are crucial to understanding ice cloud formation. We intercompare four online ice nucleation counters and reasonable agreement is found when the same ice nucleation mode is tested. A variable scaling factor was necessary to reconcile condensation freezing results with immersion freezing. Factors related to instrumental setup and aerosol generation are discussed to explain observed differences. Ice formation in clouds is an important process in the formation of precipitation, especially at midlatitudes, but the exact properties of the aerosol particles that initiate freezing is not fully understood. 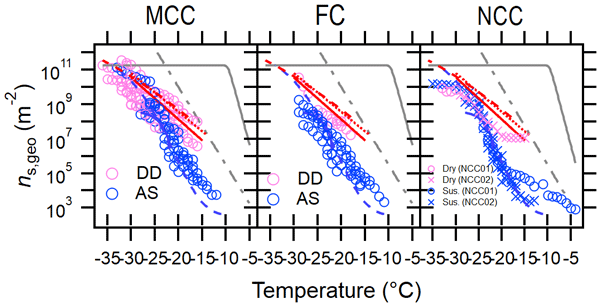 We analysed residual particles from ice crystals sampled from mixed phase clouds. The results show that the residues contain a larger relative amount of soil dust and minerals, but also particles from industrial emissions and lead-containing particles, than the out-of-cloud aerosol. 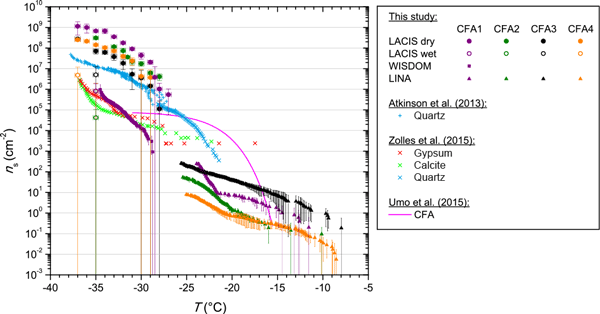 In this study, we mixed a pure mineral dust sample with ice active biological material and quantified the immersion freezing behavior of the resulting particles utilizing the Leipzig Aerosol Cloud Interaction Simulator (LACIS). Furthermore, we used different methods to investigate the mixing state of our generated aerosol. We found that internally mixed particles, containing ice active biological material, follow the ice nucleation behavior observed for the pure biological particles. In this manuscript we describe technical and analytical advances that have been implemented for use with the Frankfurt ice nuclei measurement system known as FRIDGE. In particular we focus on a new collection apparatus and improved data analysis protocol. We also provide an outline of how FRIDGE data should be interpreted and reported. Results from an example case study are presented and help to contextualize FRIDGE data with respect to other measurement techniques and modeling efforts. We have investigated the enhancement of the ice nucleation ability of well-known and abundant ice nucleating particles like dust grains due to pre-activation. Temporary exposure to a low temperature (228 K) provokes that pores and surface cracks of the particles are filled with ice, which makes them better nuclei for the growth of macroscopic ice crystals at high temperatures (245–260 K).